The Moto G (2nd gen) appears to be one of the first non Nexus or Google Play Edition devices to receive the newest update to Android 5.0.1, according to a reader of ours who picked up the update within the last hour. 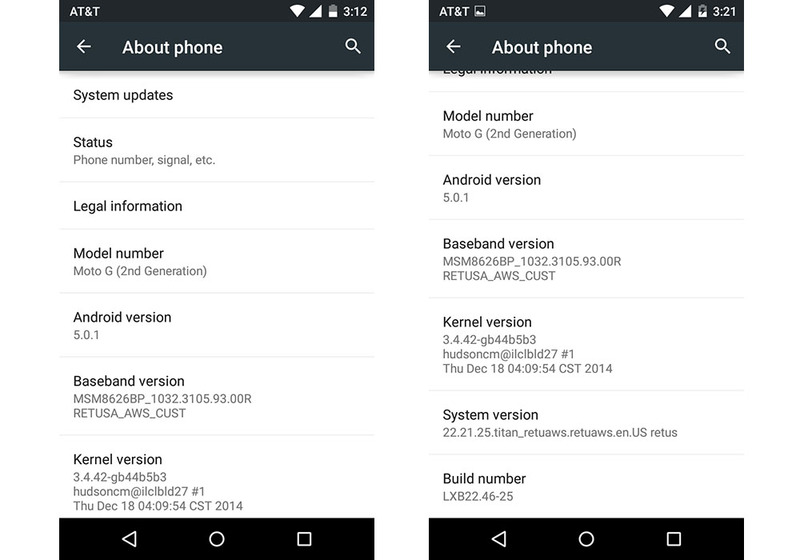 The build showed up on his phone as system version 22.21.25 and build number LXB22.46-25. It’s tough to tell if there is a wide rollout on the verge of happening or if he is simple a lucky early receiver. In case you weren’t familiar with the current Lollipop-Moto G (2nd gen) situation, just know that Motorola announced the update back in early November, except many never did receive it. It’s almost as if they discovered a last minute bug, pulled the update, and decided to go silent until the next build was ready. That time may have finally come. We are also seeing at least one Moto G (1st gen) owner as having received a similar Android 5.0.1 update. According to images posted to Google+, the original Moto G is looking at system version 220.21.25 and build number LXB22.46-25. Moto G owners, be sure to check your devices for updates!